Due to the forgiving slopes & well-established climbing routes, Haba Snow Mountain (5396 metres) is considered an ideal climb for beginners who wish to experience climbing a real 5000m snow mountain. This trip allows you to experience the typical process of climbing a snow mountain, from trekking to base camp, acclimatization climb, putting on crampons, using ice-axes, & the final summit push. Note: The 6 Day 6 Night Haba Ascent Itinerary is only available between the months of May and December. Between Jan and end April, we will be running only the 5 Day 5 Night Haba Ascent Itinerary (see details at the end) . Day 1: Fly into Lijiang (2460m), check into The Bivou and enjoy the evening either in tranquil Shuhe Old Town or bustling Lijiang Old Town 15 minutes away. Enjoy a Bivou Farmhouse Dinner. Overnight at The Bivou Lijiang. Day 2: Drive from Lijiang to Haba Village (2700m). This will take approximately 4.5-5 hours, going through ‘Tiger leaping Gorge’. Optional: Depending on availability of time, go for 1-2 hour walk or trek of Upper or Middle Gorge. Enjoy exploring the ethnically diverse Haba Village with at least 3 different minority villages, namely the Naxi, Hui (Muslim) and Yi living in harmony. Overnight in Haba Village. Day 3: With our guide, we begin the 4 to 6 hour ascend up to the Base camp at 4100 metres, walking through pristine alpine forests. Horses will be used to carry our larger personal belongings as well as supplies. You can also choose to ride a horse to Base Camp if you prefer. The base camp is located at 4100 m at the edge of the forest with a very nice view on the mountain. Overnight at Haba Base Camp. Day 4: With our guide, we begin the trek at 8.30am up to the Camp C1 at 4950 metres, trekking 5 to 6 hours. The first part of the route to the C1 is through a huge grey slab on the left of the mountain left by retreating glaciers, before reaching a series of morainic hills and ridges until we reach the glacier at about 4950 metres. Campsite C1 is about six kilometers away from the base – not a long distance, but the altitude rises sharply from 4,080 meters to over 4,960 meters in that stretch. Note that Camp C1 is a very basic camp with little facilities. Overnight at Haba Base Camp C1. Day 5: Begin the ascent to the summit at 5am. 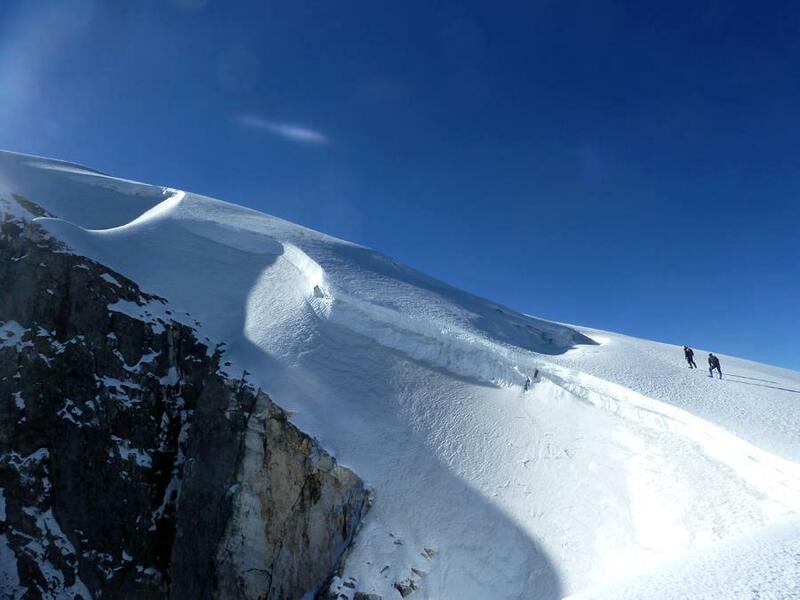 After putting on crampons, you will go up directly on a large snow/ice slope before reaching the summit after approximately 4 hours from Camp C1. About one kilometer away from Campsite C1 is the Desperate Slope, which is the last resting post before the final stretch to the top. The distance from the Desperate Slope to the summit is another 960 meters which will take you some time due to the altitude. The Desperate Slope deserves its name; when you climb one small slope, you think you have reached the top, only to find another steep climb ahead of you and no sign of the summit! From the summit, it takes another 4-5 hours to get back to Base camp before we descend to Haba Village. Overnight in Haba Village. Day 6: Return to Lijiang for overnight at The Bivou. Enjoy a Bivou Special Victory Haba cocktail! Best Time To Go: May, Sept ～ Nov. The rainy season in Lijiang and Shangri-La is between Jun and Sept.
Price: Please enquire, inclusive of 6 nights’ accommodation, 2-way airport transfer, all meals from Days 2 to 6 and Bivou Farmhouse Dinner for 2 for evening of Day 1, Victory cocktail on Day 6, transport to and from Haba Village, experienced trekking guides (at least 10 years of experience) for 1:1 guiding up the mountain, horse rental and rental of equipment (helmet, harness, carabiners, crampons & ice axe). Snacks, water and hot beverages including coffee, tea and hot chocolate included in the price. A detailed suggested Haba Ascent Packing List will be provided before the trip. Note: It is possible to do the trip in 5 days instead of 6 days, with an ascent to the Summit directly on Day 4 from Base Camp, instead of staying one more night at Camp C1. Due to the weather conditions, only the 5 Day 5 Night itinerary is available from Dec to end April. Enquire for more details. For those who need a translator, an English-speaking guide from The Bivou can accompany your group from our hotel to Haba Base Camp and back to Lijiang. Additional charges will apply.